Google (s goog) today launched its long-awaited electronic book store, called simply Google eBooks, with more than 3 million titles and 4,000 publishers participating as partners, including most of the major industry names. Independent booksellers will also be able to offer Google eBooks through a partnership with the American Booksellers’ Association, and the company is launching an affiliate network that will allow any website to do the same. The web giant’s offering — which is based on a “buy anywhere, read anywhere” philosophy — is likely to ramp up competition in the electronic book market, which until now has been dominated by Amazon (s amzn) and Apple (s aapl). James Crawford, director of engineering for the Google Books team, said the company has scanned in over 15 million books through its massive book-scanning project, which “makes us one of the largest libraries in the world.” In the Google eBook store, there will be 2.8 million books available to download free of charge, since they are in the public domain, and the rest will have a “buy” button next to them that takes readers directly to the eBook store. Google’s publishing partners include major names such as Random House, Simon & Schuster and Penguin, but also a range of smaller publishers and scholarly houses such as the Oxford University Press and Reed Elsevier. Google will pay the publisher 52 percent of the list price if a title is sold through Google’s store, or 45 percent if it’s sold through the company’s retail partners, which include Powell’s and Alibris. The web giant said it did not take a stand on whether to accept the relatively new “agency model” for selling e-books (which was introduced when Apple joined the market with the iPad), in which the publisher gets to set the price in the e-book store, rather than letting the retailer choose. Less than 10 percent of Google’s publishing partners asked for an agency deal, but they represent over half of the best-sellers in the store, the company said, and they get 70 percent of the sale price. The bookstore is available only in the U.S. for now, but is expected to roll out in Europe and other countries early next year. In addition to the publisher partnerships, Google is also launching an affiliate network, although Amanda Edmonds, director of strategic partnerships for the Google Books team, said the company so far only has one affiliate signed up, a site called Goodreads, which is devoted to books and discussion about books. Anyone reading a discussion forum or thread about a book available in the Google eBooks store will be able to click “buy” from within the discussion and go directly to the checkout at Google’s store, Edmonds said, and the site will get a share of the proceeds. 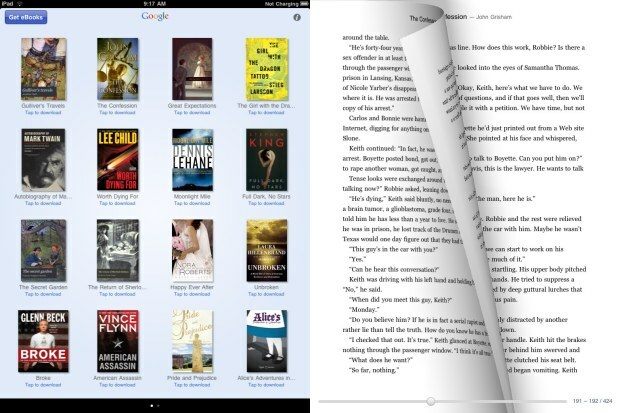 As part of today’s launch, Google is releasing a dedicated eBook-reading app for Android devices, and is “working on getting one into the iPhone store,” says Crawford. Google e-books will also be compatible with the Sony (s sne) Reader and the Nook (s bks) reader from Barnes & Noble — but only titles without digital-rights management controls will be available for reading on the Kindle, he said, because the Kindle has a closed content-protection system for its books. 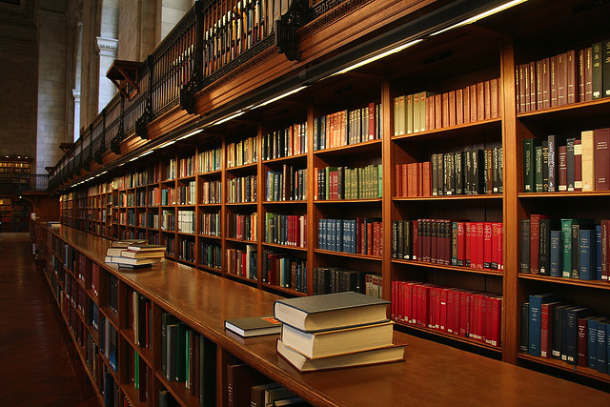 Most books will also be available in the open-source ePub format. “We’re not peddling devices here –we want to focus on selling books,” Crawford said. Google e-books will be readable in any modern web browser, and for books the company has scanned in, readers will also be able to toggle between standard view and image format, which will show the actual scans of the physical book’s pages and any photos or illustrations from the original book. The Google e-book manager said the company is focused on what he called a “cloud-based model of consumption,” in which “you never have to worry about where your book is, what page you were on, or where you bought it,” because it’s always available in your browser or app. “We think ultimately e-books should be like physical books,” Crawford said. “Most people don’t have bookshelves sorted by which retailer they bought it from.” In the longer term, the Google manager said, “maybe the industry can come together and agree on a standard for e-books so they can be shared” across devices. Will Google be able to disrupt the market with its new store? Right out of the gate, it’s one of the largest e-book stores on the Internet, and the cross-platform nature of the service will definitely appeal to many. That said, however, Amazon has a substantial head start, a lot of existing relationships with publishers, and there are many fans of both the Kindle e-book reader and the Kindle software for iPad and Android. If nothing else, book lovers should benefit from the competition. Listen, I realise that for many in the tech world, including myself sometimes, the world is dominated by Apple, but “dominated by Amazon and Apple” is plain wrong; Barnes and Noble is likely the second largest e-book retailer, and I’m willing to bet there’s a couple of others in there well ahead of Apple. Please: Apple makes excellent products, but it is *not* the sole provider of everything. You do not have any storage options to read when you are traveling in your car, camping, in flight, on a cruise, during power outages, or where ever you must incure high internet access fees. The rumors are confirmed. 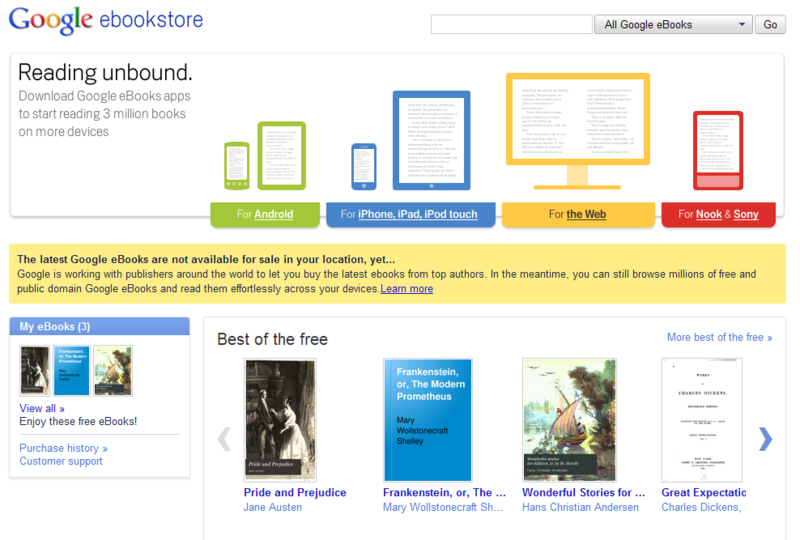 Google launches ebook store with worldâ€™s largest library of titles. If we have an internet connection then we can read it easily anytime and anywhere. But I want to purchase it. And how can I buy it? This will be good for consumers and self-publishing authors, but is yet another step that heralds a painful era for this particular set of corporate content publishers. When the majority of content has been digitized, taxing/toll both for content becomes really the only tolerable pricing model. Paul Graham has written eloquently on this phenomenon (see Post-Medium Publishing at http://www.paulgraham.com/publishing.html). This is really a good development as competition will definitely improve the market and make the books available on multiple devices. As e-book readers become cheaper and cheaper more books will be within the reach of even those readers who are not that much into gadgets. The biggest advantage of course is it is beneficial to the environment and digital books save trees at least to some extent. One more reason to boycott Amazon. But they should give 70% of revenue to everyone not just big publishers, and make it easy for self-publishing authors, too.